Long gone the days where phone is only used for calling or texting. Majority of people now own a smart phone which can do more than talking or texting. I realised over the years my used for phone has evolved tremendously. I noticed that I have been using my phone a lot at work and at home for organising and making my life more productive. 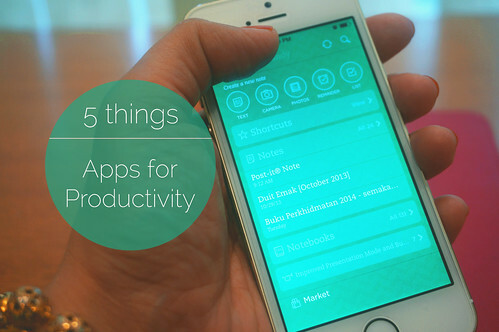 Today I am sharing how I used these five amazing apps to help keep me organise and productive on a daily basis. I have talked about Evernote in the past and until today I am still using Evernote for my note taking needs, keeping everything in one place like my receipts, bills, certificates and many more and I also used it for keeping my most important emails. Lately I have been using Evernote to keep all my contacts with photos. It is not a good idea to keep your contact on your phone only. I also have a notebook dedicated to keep track of all the digital scrapbook kits I bought by month and tag them by year. That way I immediately have a quick view of all the digital scrapbook kits I bought that month. I love Calendar 5 App not because of it's beautiful design but also because it can seamlessly syncs my activities and tasks to iOS Calendars, Reminders and Google Calendar. I can access everything from any devices. How cool is that?! This is my one and only calendar I used in my phone and this help me to be in the know when is my next appointment will be at. I just wish they made one for Mac. Dropbox is also one of the first and the coolest could drive I have ever used and I have been using this for more than two years. Lately I have upgrade to a pro version and I can really do a lot with dropbox. I used Dropbox as my portable usb, the place where I sync my DayOne App, where I kept my screenshots, my project life files and layouts, where I kept my fonts - (I like having the same type of fonts on my PC and Mac and also my Phonto App) and I also used Dropbox to sort and organised photos that I wanted to print on my Canon Selphy. I used DayOne app as my daily journal. How does this contribute to my productivity? Well, have a special place for me to jot down ideas and express my emotions is a plus in my world. This leave my brain free to do some critical thinking and planning. I am totally in love with DayOne app on the first day I used it on my iPhone and iMac. Once again the ability to access your content from any of your devices is a selling point for me. I also used DayOne App for my project life and Project 365. I usually set a reminder on DayOne App to journal daily. By the end of the week when I sit down to do my Project Life layout and blog post about Project 365, I have all my journal right there on DayOne app for me to use or modify. everyday to be more organise and productive? Do you rely on technology or do you use normal daily planner?